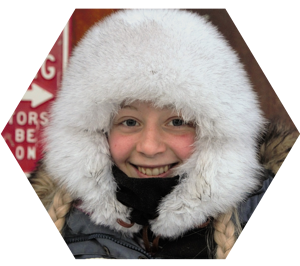 (12.03.2019) Hanna Lyrek from QRILL Pet Mushing Team is the youngest musher to ever win the Finnmark race in the 500 km class. She passed last year’s winner Harald Tunheim, an experienced Norwegian dog musher and became Norwegian Champion in long-distance dog sledding. Hanna Lyrek (19) and her seven dogs were the first to pass the finish line in Alta at 04:45 am Tuesday morning. She completed the 570 km Finnmark trail in 40 hours and 23 minutes. The distance between the last checkpoint Karasjok and Alta is estimated to take about 11 hours, while Lyrek and Tunheim completed the trail in just over 9 hours. “The competition was though this year, and I did not expect to win. The biggest success factor in this sport are the dogs. Keeping them happy and healthy, with the right nutrition and equipment they need to succeed has been one of our primary focus this year,” said champion Hanna Lyrek. “I want to thank everyone who contributed to the race, volunteers and race organizers. It is amazing that people put in so much time and effort for us, to do what we love to do,” she added. Lyrek is the first dog musher to complete all three distances in the Finnmark race. She won the junior race two years ago. In 2018, she was the youngest dog musher to ever compete in Europe’s longest dog-sled race which is 1200 km. Lyrek has already announced that she will participate in Finnmark race 1200 km next year and that her biggest dream is to compete at the Iditarod. In 2018, the world’s first professional long-distance dog sled team was launched. Lyrek was the first young musher to join. The team is a new concept in the world of long-distance dog sled races and sponsors top athletes such as Thomas Wærner (winner of Finnmark race 2013 and Femund race 2019), Marit Beate Kasin, Joar Ulsom (winner Iditarod 2018) along with four-time winner of Iditarod, Dallas Seavey from the USA. Focusing on race-winning performance, along with making a positive contribution to a unique and challenging endurance sport, QRILL Pet Mushing Team is more than ‘just’ a team. Part race equipment, part pet nutritional study, and part recruitment vehicle for the sport itself, the team is sponsored by Aker BioMarine’s brand QRILL Pet, Appetitt, Non-Stop Dogwear and Hundekjører Butikken. “Being part of the QRILL Pet Mushing Team is such an inspiration for me. I look up to the more experienced mushers, who have been great mentors to me as a younger musher. Now, I hope to inspire other young mushers to follow their dreams, just as I do,” said Lyrek just before the race. March is when the biggest races of the season happen. Both the 1200 km Finnmark race and Iditarod, also known as the Last Great Race on Earth are currently in full speed, and the other four members of the QRILL Pet Mushing Team are currently holding top positions in both races. “Becoming Norwegian Champion in long-distance dog sledding at this age is an incredible achievement, we could not have been prouder to have Hanna Lyrek on the team. Her team has put in such a great performance and showed that we have some of the best dog mushers in the world in our team. We are crossing our fingers for more QRILL Pet Mushing Team wins this season,” said Knut Heggen, head of sales, QRILL Pet, Aker BioMarine. “Together with our partners, we will continue to invest heavily in research and development of optimal nutrition for the dogs, to ensure their health and well-being. That our team members perform so well in the races; shows that we are on the right track,” said Heggen. Aker BioMarine is a biotech innovator and Antarctic krill-harvesting company, dedicated to improving human and planetary health. The company develops krill-based ingredients for nutraceutical, aquaculture, and animal feed applications. The company’s fully transparent value chain stretches from sustainable krill harvesting in pristine Antarctic waters through its Montevideo logistics hub, Houston production plant, and all the way to customers around the world. Aker BioMarine is fully owned by Aker ASA, an industrial pioneer since its establishment in 1841.